A genetically modified rat is the first rodent model to exhibit the full range of brain changes found in Alzheimer's. This new rat model, with some human genes, more closely reflects the human condition in Alzheimer's. University of Southern California Keck School of Medicine. A new genetically engineered lab rat that has the full array of brain changes associated with Alzheimer’s disease supports the idea that increases in a molecule called beta-amyloid in the brain causes the disease, according to a study, published in the Journal of Neuroscience. The study was supported by the National Institutes of Health. “We believe the rats will be an excellent, stringent pre-clinical model for testing experimental Alzheimer’s disease therapeutics,” said Terrence Town, Ph.D., the study’s senior author and a professor in the Department of Physiology & Biophysics in the Zilkha Neurogenetic Institute at the University of Southern California Keck School of Medicine, Los Angeles. Alzheimer’s is an age-related brain disorder that gradually destroys a person’s memory, thinking, and the ability to carry out even the simplest tasks. Affecting at least 5.1 million Americans, the disease is the most common form of dementia in the United States. Pathological hallmarks of Alzheimer’s brains include abnormal levels of beta-amyloid protein that form amyloid plaques; tau proteins that clump together inside neurons and form neurofibrillary tangles; and neuron loss. Additionally, glial cells — which normally support, protect, or nourish nerve cells — are overactivated in Alzheimer’s. Plaque-forming beta-amyloid molecules are derived from a larger protein called amyloid precursor protein (APP). One hypothesis states that increases in beta-amyloid initiate brain degeneration. Genetic studies on familial forms of Alzheimer’s support the hypothesis by linking the disease to mutations in APP, and to presenilin 1, a protein thought to be involved in the production beta-amyloid. Researchers often use rodents to study diseases. However, previous studies on transgenic mice and rats that have the APP and presenilin 1 mutations only partially reproduce the problems caused by Alzheimer’s. The animals have memory problems and many plaques but none of the other hallmarks, especially neurofibrillary tangles and neuron loss. To address this issue, Dr. Town and his colleagues decided to work with a certain strain of rats. “We focused on Fischer 344 rats because their brains develop many of the age-related features seen in humans,” said Dr. Town, who conducted the study while working as a professor of Biomedical Sciences at Cedars-Sinai Medical Center and David Geffen School of Medicine at the University of California, Los Angeles. The rats were engineered to have the mutant APP and presenilin 1 genes, which are known to play a role in the rare, early-onset form of Alzheimer’s. Behavioral studies showed that the rats developed memory and learning problems with age. As predicted, the presence of beta-amyloid in the brains of the rats increased with age. However, unlike previous rodent studies, the rats also developed neurofibrillary tangles. The researchers performed a variety of experiments confirming the presence of neurofibrillary tangles in brain regions most affected by Alzheimer’s such as the hippocampus and the cingulate cortex, which are involved in learning and memory. Further experiments showed that about 30 percent of neurons in these regions died with age, the largest amount of cell death seen in an Alzheimer’s rodent model, and that some glial cells acquired shapes reminiscent of the activated glia found in patients. “Our results suggest that beta-amyloid can drive Alzheimer’s in a clear and progressive way,” said Dr. Town. 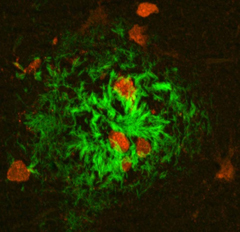 Activation of glia occurred earlier than amyloid plaque formation, which suggests Dr. Town and his colleagues identified an early degenerative event and new treatment target that scientists studying other rodent models may have missed. The findings support a prime research objective identified during the May 2012, NIH-supported Alzheimer’s Disease Research Summit 2012: Path to Treatment and Prevention, an international gathering of Alzheimer’s researchers and advocates. Improved animal models were cited as key to advancing understanding of this complex disease. In addition to grants from NINDS (NS076794), NIA (AG029726, AG033394) and the NIMH Intramural Research Program, this study was funded by the Alzheimer’s Association (IIRG-05-14993, ZEN-10-174633) and the Ellison Foundation/American Federation for Aging Research (M11472). NINDS is the nation’s leading funder of research on the brain and nervous system. The NINDS mission is to reduce the burden of neurological disease — a burden borne by every age group, by every segment of society, by people all over the world.